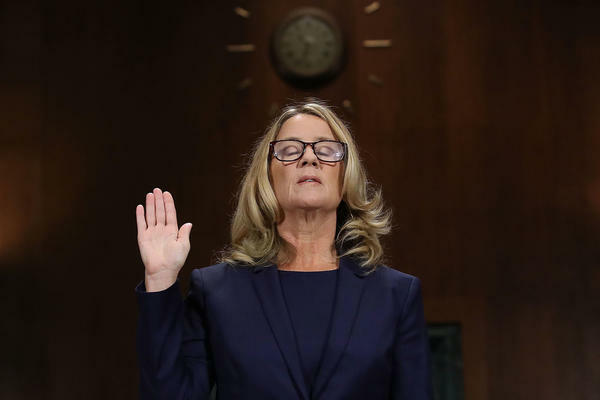 Christine Blasey Ford is sworn in ahead of testifying before the Senate Judiciary Committee on Thursday. In Thursday's testimony at Judge Brett Kavanaugh's confirmation hearings, Christine Blasey Ford alleged Kavanaugh sexually assaulted her at a party in 1982, when she was 15 years old and he was 17. Kavanaugh staunchly denied these allegations. But memory is fallible. A question on many people's minds is, how well can anyone recall something that happened over 35 years ago? Pretty well, say scientists, if the memory is of a traumatic event. That's because of the key role emotions play in making and storing memories. On any given day, our brains store or "encode" only some of the things we experience. "What we pay attention to is what's more likely to get encoded," says Jim Hopper, a teaching associate in psychology at Harvard University and a consultant on sexual assault and trauma. A region of the brain called the hippocampus plays an important role in this process. Ford referred to the hippocampus when questioned by Sen. Dianne Feinstein, D-Calif., about how she was so sure that Kavanaugh was the perpetrator of the alleged assault. "The hippocampus certainly plays a role in taking things into short-term memory and then transferring them and consolidating them into long-term memories," says Hopper. If an event elicits an emotional reaction in us, then it's more likely to make it into our memory. "Things that have more emotional significance tend to get more encoded," he says. And when something elicits an intense negative emotion, like a trauma, it's even more likely to be encoded in the brain. "The stress hormones, cortisol, norepinephrine, that are released during a terrifying trauma tend to render the experience vivid and memorable, especially the central aspect, the most meaningful aspects of the experience for the victim," says Richard McNally, a psychologist at Harvard University and the author of the book Remembering Trauma. That's because a high-stress state "alters the function of the hippocampus and puts it into a super-encoding mode," says Hopper, especially early on during an event. And "the central details [of the event] get burned into their memory and they may never forget them." Whether it's sexual assault victims or soldiers in combat or survivors of an earthquake, people who have experienced traumatic events tend to remember the most essential and frightening elements of the events in vivid detail for life, says McNally. However, this doesn't mean that these memories include every detail of the event. The brain holds on to the most important stuff at the expense of the peripheral details. Take, for example, a clerk at convenience store who gets robbed at gunpoint, says McNally. "The person may often encode the features of the weapon, the gun pointed at him, but not recall whether or not the person was wearing glasses, because their attention is focused on the most central features of the experience." McNally says this would explain why Ford says she remembers what happened during the alleged assault but she can't remember the date of the party or its location. "They were forgotten because they were never encoded," says McNally. "When somebody has an experience such as this, they're not necessarily saying, 'I better get down the address.' They're preoccupied with trying to escape this terrifying experience." Also, "people in general are not good about dating events, whether they're traumatic events or nontraumatic events," he adds. Unless there are other clues to the date, most people tend to forget when something happened. As for the memory of perpetrators of sexual assault, there's been little research on it, says Hopper. But what the research on emotions and memory suggests is the perpetrator's memory will depend on their emotional state, he says. "If holding someone down and trying to take their clothes off was an entertaining experience, or a routine, familiar experience you're less likely to store that," he says. "It really depends on how the perpetrator is relating to things." Another factor that affects how memories are stored is alcohol use. "Generally alcohol can make people forget things," says Mary Beth Miller, a clinical psychologist at the University of Missouri, Columbia who has studied the impact of alcohol consumption on making and retrieving memories. Earlier this month, Ford told The Washington Post that she remembers Kavanaugh being "stumbling drunk" whereas she recalls having one beer that night. Other accusers who did not testify Thursday have also suggested Kavanaugh was part of a group of friends who indulged in heavy drinking in the 1980s. In his testimony, Kavanaugh said he likes beer, but he denied ever drinking so much that he didn't remember things. Miller says memory loss from alcohol — blackouts — are very common among young people. "In a blackout, you're walking around, talking to people," says Miller. "And a lot of times in a blackout people will be very coherent. You're just doing your thing, and people don't know, because it's hard to know if someone's in a blackout state." These blackouts are what scientists call "fragmentary" blackouts, where someone has partial memory loss, but "you can usually recall, if someone reminds you later." Miller also says that animal studies suggest that "adolescent brains are actually more sensitive to the memory impairing effects of alcohol." A permanent memory impairment, what scientists call "en bloc blackout," has a beginning and an end, says Miller, and the person cannot remember anything that happened in between. She says these typically occur at higher blood alcohol concentrations, around 0.24. This is because higher amounts of alcohol prevent short-term memory from being converted to long-term memory, says Miller. "And people with a history of heavy drinking are more likely to have more memory deficits," she adds.